The Chamera di Percezione (Perception Room) project seeks to amplify perception by triggering an enhanced experiential relationship between viewer and artwork. Huge high-definition images of Raphael’s Madonna of the Goldfinch, projected in a “magic box”, make it possible for the viewer to penetrate the painting from multiple angles and also reveal the recent restoration process. 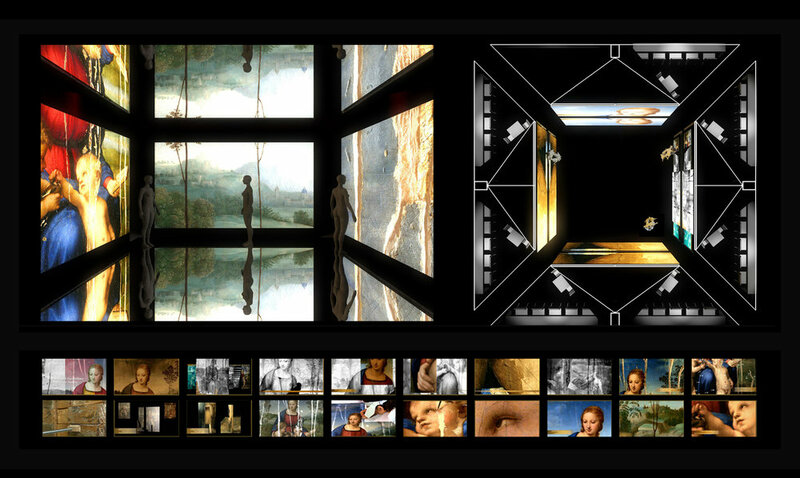 The images and sequences of the Chamera di Percezione project are organized into a crescendo linked to varying levels of experiencing the painting. This arrangement provides each viewer the opportunity to pursue the approach best suited to him or herself from among the multiple avenues available, and so places the observer at the centre of the project. The project focuses on two main objectives: making a better connection between visitors and the artwork, and finding new methods for measuring this relationship by studying embodiment and cognition in augmented reality environments. Using protocols developed during our Luca Giordano project, visitors undertaking this multisensory experience participated in both qualitative and quantitative impact assessments. The qualitative methods are those that collect data in the form of interviews, words, comments, visual images and documents. Observed behaviour, ideas, actions and experiences are then processed in line with detailed written descriptions and explanations of the phenomena studied. Quantitative data, collected using established techniques of psychophysiological research, measures various parameters of bodily function in order to record the reaction of the entire psychosomatic system, especially emotional reactions. The analysis of non-verbal communication indicated a remarkable frequency of more relaxed expression and brighter eyes following a visit. The Chamera di Percezione is an immersive set fitted with mirrored ceilings and floors. The walls are screens onto which four multimedia projectors project different levels of reading the artwork and its history. From inside the “magic box” the viewer is offered four different narrative itineraries, each of which is punctuated by moments of synchrony that bring us back to the unity of the work and the experience itself. Raphael’s Madonna of the Goldfinch presents a number of levels of reading simultaneously. The videos projected in the “magic box” combine original images of the masterpiece enhanced for storytelling with virtual sequences and 3D reconstructions gleaned from scientific documentation recorded during the lengthy and delicate restoration of the painting at the prestigious Opificio delle Pietre Dure of Florence in liaison with the local Soprintendenza per i Beni Culturali e Ambientali (Cultural Heritage Commission) and the Uffizi Gallery. The videos guiding the viewer’s journey follow the movement of the morphological field of the painting. At the upper right of Raphael’s masterpiece clouds open, pointing in the direction of Mary’s head. Something is moving towards her and the clouds make way for it. The work expresses a pregnant and serene force. The movement continues with Mary’s gaze upon the young Saint John, who is in turn looking at the child Jesus and handing him a goldfinch, which will be stained with his own blood. This is the fulcrum of the field we are led to follow—in an anti-clockwise direction if we start from the sky (the immanent); and in a clockwise direction if we start from the child Jesus (the temporal). In this way a number of dimensions of existence are presented in different temporal phases with planes of reading overlaid, affording multiple possibilities of access to the masterpiece and permitting each person to follow that which comes most naturally. The central composition has a triangular structure, a form perceived through the movement of the gaze of the observer, whose eyes are invited to pursue a route that is circular, or rather ovoid, that of the “mandorla,” or almond, a recurrent and well-studied motif in sacred art that is itself dense with semantic and symbolic significance. The structure of the painting invites intuitive perception through eye movement, enabling viewers to internally reproduce the action of the different subjects before their attention dilates outward into investigation of the surrounding landscape. This is the process amplified and studied by the Chamera di Percezione. High definition reproduction combined with macro optics make it possible to see the tiniest details close-up. In this way the general public is invited to admire the work from a vantage point that is normally the prerogative of restorers. 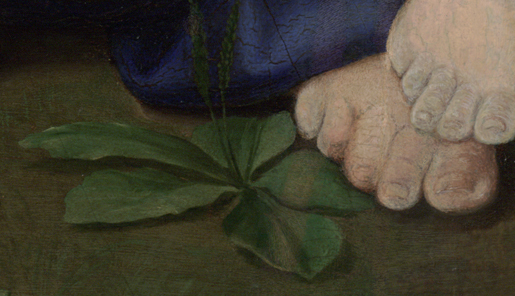 The details of Raphael’s brushstrokes can be observed in the goldfinch, in the curls of hair, and in the various haloes, offering a unique opportunity for insight into how the marvellous pictorial quality creates an effect of such strong evocative appeal. Cultural Heritage encapsulates a multiplicity of information about human beings that can be accessed through multidisciplinary instruments oriented towards reciprocal synergy. The potential for knowledge enhancement in these fields is vast. This project, an investigation into the relationship between visitors and works of art in an augmented perception environment, represents a contribution to the drafting of a study protocol. We believe works of art are magic: it is the task of those responsible for the transmission of cultural heritage to ensure that the prodigy is repeated—and transformed from experience into knowledge.